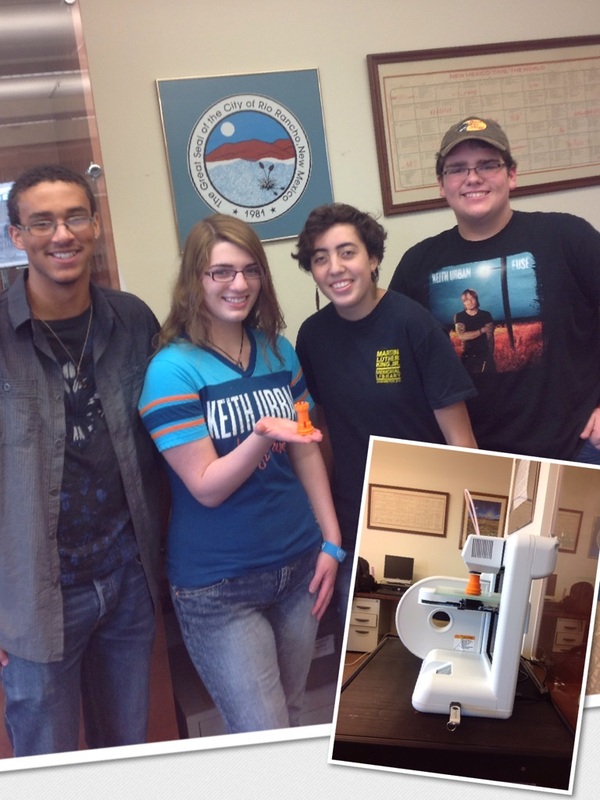 The Rio Rancho Libraries became involved in 3D printing via curiosity; a Youth Services Librarian and several members of the TAG group attended an introductory workshop at the New Mexico Natural History Museum. The NM State Library happened to be at the same workshop. The mutual interest in bringing 3D printing to New Mexico via libraries led to Rio Rancho being the first library to borrow the State Library’s equipment as a test bed for introducing the technology to libraries. The librarian & teens have worked with the equipment for 2 hours/week and are documenting the hints and resources to provide via the State Library to other libraries who borrow the equipment. It has been a lot of fun, sometimes frustrating, but mostly an exciting adventure! You’ll find several resources linked here…. This Prezi shows parallel paths of the larger scene of 3D printing at libraries, and the path of the New Mexico State Library & recent partnership with the Rio Rancho Libraries. Both paths end with the “pie in the sky” view of New Mexico being involved in the global maker movement. Here are some pdf files for you to peruse as well. “Resources” is a listing of resources for 3D printing, scanning, and design. “Resources for Educators” has some blogs and things of interest for librarians and other educators. And the third file was written by a teen volunteer and contains hints about working with various 3D Design software to save files in a format friendly to the Cube 3D Printer.